AgResearch senior scientist Dr Linda Samuelsson says results of the trial to test the benefits of sheep milk for human consumption should be available next year. In what is believed to be a world first, AgResearch is about to begin a clinical trial to test the benefits of sheep milk for human digestion. Some people suffer from digestive issues with milk, and work by AgResearch has demonstrated sheep milk could offer advantages for some in terms of easier digestion and improved nutrition. ”Based on the literature we have seen, there has been no human clinical trial like this before measuring the digestibility of sheep milk,” says AgResearch senior scientist Dr Linda Samuelsson. France should appoint a “food safety police” and increase fines on those who sell contaminated products to avoid a repeat of the salmonella outbreak at a Lactalis milk factory last year that led to dozens of babies falling ill, lawmakers said. Lactalis, the world’s largest dairy group, had to recall more than 12 million tins of baby milk in France and around the world due to the outbreak, in a scandal that hit the reputation of France’s strategic agri-business industry in overseas markets. France’s National Assembly launched a special enquiry into the scandal, which deepened when errors in the massive product recall left some potentially contaminated baby milk on shop shelves. In their findings, lawmakers recommended tougher judicial and financial sanctions against food makers in case they sell a contaminated product. 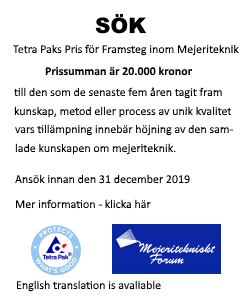 Järna Mejeri, mejeriet från Stockholms södra jordbruksområde, byter skepnad under Prideveckan. De prisbelönta vita förpackningarna antar regnbågens alla färger – för varje såld förpackning skänks dessutom 50 öre till RFSL. Järna Mejeris mjölk säljs i butiker i Storstockholmsområdet och Sörmland. Mengniu, a leading Chinese dairy manufacturer, has upgraded its premium line of organic milk in collaboration with Tetra Pak, making it the first white milk in the world to use Tetra Prisma® Aseptic 250 Edge with DreamCap™​​. The new product line has a higher protein content, tastes better and stands out on the shelf thanks to a refreshed look. Dairy price recovery in 2017 has positively affected the combined turnover of the top 20 companies, which, in 2017, was up 7.2% on the year in US dollar terms and 5.1% in euro terms, according to Rabobank’s latest Global Dairy Top 20 – A Shuffling of the Deck Chairs report. The world’s largest food & beverage company, Switzerland’s Nestlé, reigns supreme on the list, but the gap between number one and number two has narrowed. French Lactalis swapped places with compatriot Danone and moved into second place, boosted by its acquisitions of US yoghurt businesses Stonyfield and Siggi’s. Danone slipped to the third spot, after divesting Stonyfield following the acquisition of WhiteWave, reducing its stake in Yakult, and selling its holdings in the Al Safi Danone joint venture in Saudi Arabia. Arla Foods continues to hold position 7 with 10.3 M€ turnover 2017. At the GDT event this week the price index went down, this time with 1.7 percent. Butter fell 8.1 percent. The past four events show a falling trend. At an event held at the London School of Economics (LSE), Arla Foods will warn that if the findings of a LSE report prove true, non-tariff barriers to trade and restricted access to labour after Brexit will leave British consumers facing a dairy dilemma which could see the availability of butter, yoghurts and cheese become restricted. The Government’s White Paper on the UK’s future relationship with the EU sets out proposals to ease trade between this country and Europe. But this is still to be agreed with the EU, and as is identified in the report from the LSE, The impact of Brexit on the UK dairy sector, any friction and any limitations on access to key skills will mean that UK consumers pay the price through less choice, higher prices, and potentially lower food standards. That it will become much more difficult to import dairy products from Europe, leading to a shortage both of dairy staples and particularly of products such as speciality cheeses, where domestic supply is constrained by limited production capacity in an already tightly managed supply chain. Escalating pressure on costs, and ultimately increased consumer prices for dairy goods. Current dairy imports include cheese, butter, butteroil, whey, buttermilk and fermented products, yoghurt, concentrated milk, powders, milk and cream, infant formula and ice cream meaning that the impact could be widespread. That ways are found somehow to ramp-up production and cut farm costs, which in the short-term at least would inevitably undermine the world-leading standards of our dairy industry – something neither farmers nor consumers would accept. This is in addition to costly impacts throughout the supply chain, problems that could be exacerbated by a shortage of vets, lorry drivers and farm workers post-Brexit. 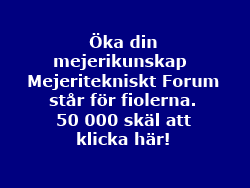 Förbud för tillverkning och försäljning av samtliga livsmedel. Det blev resultatet av den oanmälda kontroll Livsmedelsverket nyligen gjorde på Eddis ost i Norrköping. Livsmedelsverket har efter tips från Norrköpings kommun och Arbetsmiljöverket kontrollerat Eddis ostfabrik i Norrköping. Vid kontrollen konstaterades stora hygieniska brister och anläggningen var dessutom varken registrerad eller godkänd för tillverkning av mejeriprodukter. Livsmedelsverket förbjöd därför all tillverkning och försäljning av livsmedel direkt på plats. 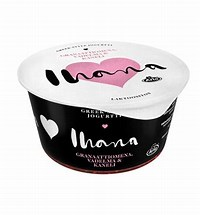 Arla Foods is to expand its successful Finnish brand, Ihana, into new markets with the premium yogurt range launching in Denmark this spring and the UK this week. 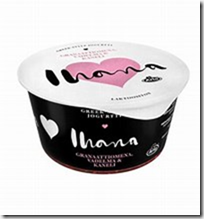 Meaning ‘wonderful’ in Finnish, Ihana was launched through an extensive brand launch in 2016 in Finland with an iconic new design. Indulgence is one of the few areas in growth within the yogurt category as consumers look for something new and different. With its range of unique sorbet-style flavour combinations such as pink lemonade and papaya & lime, the bold flavour creations, striking packaging and dessert-style approach to yogurts ensure it is perfectly positioned to offer retailers unique products and shoppers a distinctive choice at the fixture. Made with natural ingredients and lactose-free, Ihana taps into key trends that fit with consumers’ lifestyles. Offering authentic yogurts that provide an indulgent treat with a thick and creamy texture, the products come with Arla’s farmer owned credentials and made with the best possible ingredients.